The two issues that the rich and famous in world capital like to discuss with wringing hands and weeping are: global warming and climate change; and rising inequality of incomes and wealth. Davos realises that the popular reaction to these issues is threatening the destruction of what they call the “liberal order” ie the free and untrammeled movement of capital and commodities to where profits can be maximised. It may be snowing and freezing in Davos, but the hypocrisy of the deliberations at Davos on these issues is exposed every year by the news that over 1500 individual private jet flights are made by the participants to get to the Swiss ski resort venue for the World Economy Forum – that’s some carbon footprint. The Davos devotees are transported to a special airfield in Dubendorf so they do not have to mix with the unwashed. It makes a cruel joke of the Davos session led by famous anthropologist David Attenborough telling the audience that urgent action was needed on climate change. The number of private jet flights grew by 11% last year. “There appears to be a trend towards larger aircraft, with expensive heavy jets the aircraft of choice, with Gulfstream GVs and Global Expresses both being used more than 100 times each last year,” said Andy Christie, private jets director at ACS. As for rising inequality, every year at the same time as Davos, Oxfam, the international poverty charity, publishes its report on the degree of inequality of personal wealth globally. This year, its headline story was that just 26 people own as much wealth as the poorest 50% (3.8 billion) of people in the world. Apparently, between 2017 and 2018 a new billionaire was created every two days. Oxfam said the wealth of more than 2,200 billionaires across the globe had increased by $900bn in 2018 – or $2.5bn a day. The 12% increase in the wealth of the very richest contrasted with a fall of 11% in the wealth of the poorest half of the world’s population. The world’s richest man, Jeff Bezos, the owner of Amazon, saw his fortune increase to $112bn. Just 1% of his fortune is equivalent to the whole health budget for Ethiopia, a country of 105 million people. Mainstream economists often like to make the point that global poverty (as defined by the World Bank threshold) has been falling fast. But Oxfam respond that most of this reduction is due to China’s rapid growth over the past four decades. This is something that I have shown in previous posts. 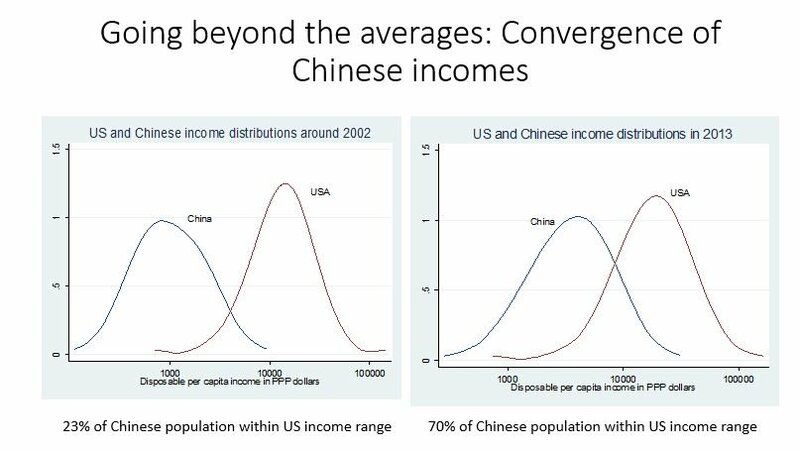 And global inequality expert, Branco Milanovic in a lecture taking place at the same time as Davos, showed that such is the improvement in real incomes of hundreds of millions of Chinese, that now 70% of the Chinese population have incomes within the range of incomes earned by Americans, up from 23% just 15 years ago! In contrast, Oxfam add that the World Bank data show that the rate of poverty reduction had halved since 2013. Indeed, in sub-Saharan Africa, extreme poverty was on the increase. Oxfam said its methodology for assessing the gap between rich and poor was based on global wealth distribution data provided by the Credit Suisse global wealth data book, covering the period from June 2017 to June 2018. The wealth of billionaires was calculated using the annual Forbes billionaires list published in March 2018. 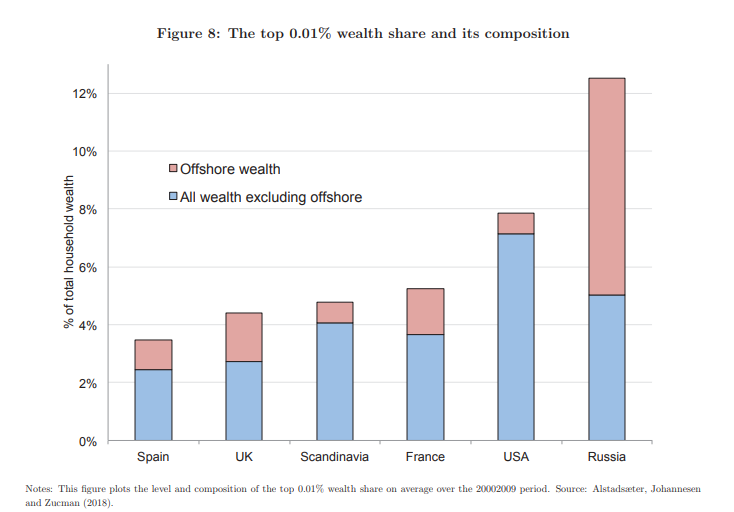 I have commented on the Credit Suisse report before, but now in a brand new paper by Gabriel Zucman has updated the data on global wealth inequality. He finds a rise in global wealth concentration since the start of globalisation and the ‘liberal world order’ in the 1980s. 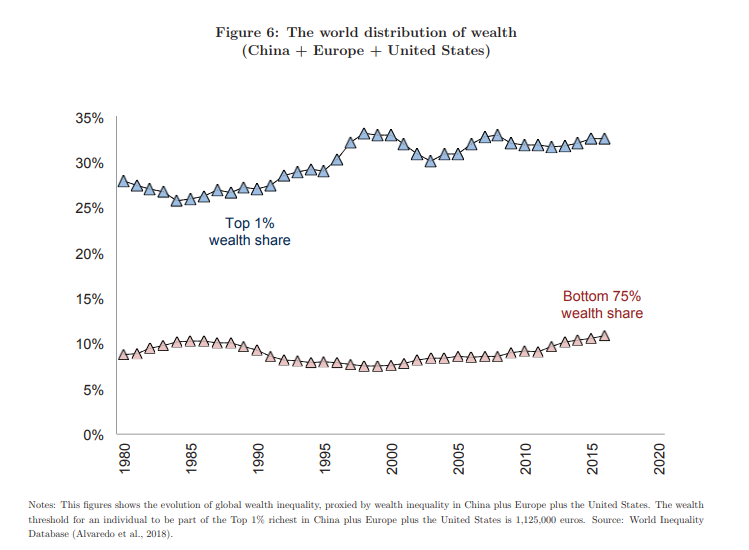 For China, Europe, and the United States combined, the top 1% wealth share has increased from 28% in 1980 to 33% today, while the bottom 75% share hovered around 10%. The rise in the wealth of the very, very rich that the Oxfam report concentrates on is truly staggering in the US: at its highest degree in 100 years. And this underestimates the full degree of inequality because the very, very rich hide much of their wealth in secret tax havens. Despite this staggering data, the Davos crowd are not keen on any attempt at redistribution. Oxfam makes a modest call for a 1% wealth tax similar to the call made by French economist Thomas Piketty in his World Inequality Report 2018, which showed that between 1980 and 2016 the poorest 50% of humanity only captured 12 cents in every dollar of global income growth. By contrast, the top 1% captured 27 cents of every dollar. Left-wing Democrat congresswoman Alexandria Ocasio-Cortez has also called for a higher marginal tax rate on the richest Americans. But the great and good at Davos have poured cold water on all these modest policy measures. A common mainstream objection to elevated top marginal income tax rates is that they hurt economic growth – an argument voiced again by the Davos crowd. But Zucman and Saez point out that the US grew more strongly in the 1950s when it had a top marginal tax rate around 90%. Of course, what this shows is that when US capitalism was growing fast and profitability was high, the elite could afford to allow progressive taxes – if pressured. It was the same story with Japan after the war. As Zucman and Saez say “maybe in those years the United States, as the hegemon of the post-World War II decades, could afford “bad” tax policy?” In contrast, when Russia was taken over by capitalism, top marginal tax rates were cut from 85% to flat rate tax for all at 13%. The bottom 50% of the population suffered a massive cut in real living standards for over a decade and inequality in Russia rocketed. Zucman and Saez echo Marx’s view when they say that “Progressive income taxation cannot solve all our injustices. But if history is any guide, it can help stir the country in the right direction, …. Democracy or plutocracy: That is, fundamentally, what top tax rates are about.” Having said that, the cause of high and rising inequality is to be found in the process of capital accumulation itself. It is not primarily the lack of progressive taxation of incomes or the lack of a wealth tax; or even the lack of intervention to deal with tax havens. Such policy measures would make certainly help improve things. 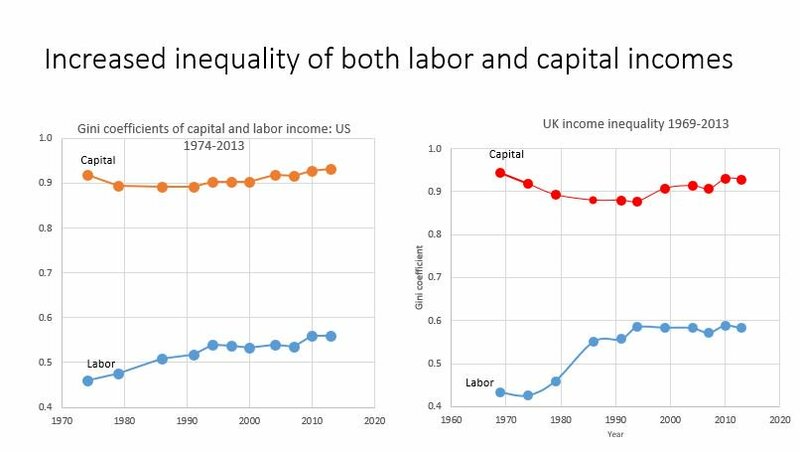 But if pre-tax income from capital (profit, rent and interest) continues to rise at the expense of income from labour (wages), then there is a built-in tendency for inequality to rise. Branco Milanovic shows that is just what has been happening in the major capitalist economies over the last 50 years. 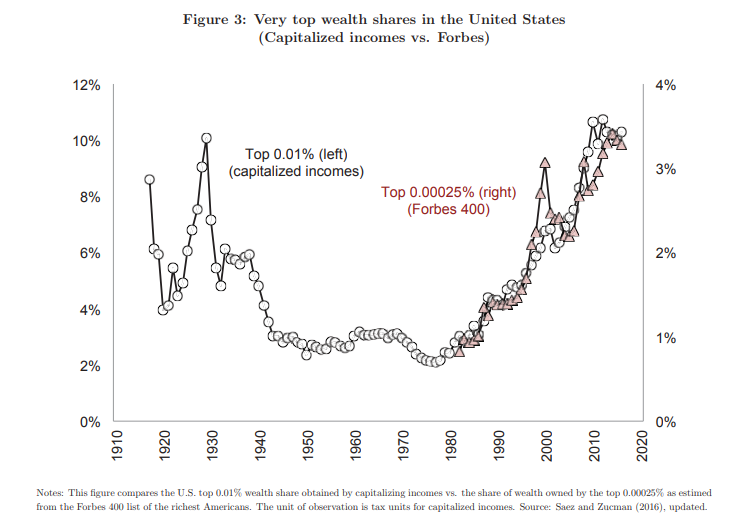 The very rich capitalists have been getting richer compared to the less rich capitalists and the higher paid income earners have gained relatively to the lower paid. Rising global inequality will not be reversed by a redistribution of wealth or income through taxation alone. It will require a complete restructuring of the ownership and control of the means of production and resources globally. Meanwhile Davos will continue to offer crocodile tears. This entry was posted on January 23, 2019 at 10:38 am and is filed under capitalism, economics. You can follow any responses to this entry through the RSS 2.0 feed. You can leave a response, or trackback from your own site. Unless I’m missing something, Milanovic’s two income charts look strange. They look pretty much like “bell curves”, but income distributions are NEVER symmetrical like that. After all, income inequality means that a lot of people have small incomes, a few have huge incomes. Oops. I had not noticed, but the horizontal axis is in log scale. My bad. Yes I had not noticed that either. Yes, it’s all becoming rather farcical. Half of the world is surviving on about $7,300 a year for a family of four. (4 x $5 x 365 = $7,300) In the U.S. the poverty level for four person family is $25,000 about. So about 1/3rd of the U.S. poverty level is where half of the world’s population is living. Does our economic system benefit the world’s population? No. Two parents in a 4 person family would mean an average wealth of $126,200, and yet $7,300 a year is all the resources half of humanity have to get through the year. Credit Suisse reports, page 18, in year 2000 median wealth per adult was $1,494, and average wealth per adult was $31,381 — a ratio 1 to 21. By 2017 median wealth per adult was $4,209, and average was $63,100 — a ratio of 1 to 15. This is good, but most of the gain came in China, and still 60% of the world’s adults own less than $2,100, see page 117. Digesting all these figures is difficult, the primary idea is –most humans on the planet are benefitting very little from modern progress. I have long believed in Special Drawing Rights, SDR, created from the World Bank to the tune of 2% of world wealth (2% x $317 trillion = $6.34 trillion yearly). These funds would be allocated somehow to build 21st century infrastructure, public health, hospitals, educational systems. I’m vague about what they would build, but I very much doubt any inflation would result. Wealth growth has exploded in the world, the Credit Suisse reports that “wealth per adult” has increased from $31,381 in 2000 to $63,100 in 2018, doubling in 18 years. (see page 152 Databook, Credit Suisse Global Wealth Report). Has this caused price inflation? No. What happens to wealth that is not consumed? It pumps up asset prices, mostly financial asset prices. The Fed’s Flow of Funds report shows that “net household worth” increased from $48 trillion in January, 2009, to $109 trillion in December, 2018 — adjusting for inflation it is less than doubling. Fortunately now both Senators Sanders and Warren have proposed a surtax (Sanders) and a wealth tax (Warren). It’s also time to review the proposal by Robin Hahnel for a socialistic approach involving consumer boards and production boards, eliminating private ownership of major corporations, as strange as that sounds. And I’m not done — the United Way charity has issued a report that 40% of Americans cannot pay their monthly expenses including food, shelter, utilities, medical care, transportation, phone service and child care — see United Way ALICE (Asset Limited, Income Constrained, Employed). So the system is clearly not serving the people adequately.